Fears that next year’s African Nations Championship will be taken away from Kenya grew by a mile on Sunday afternoon as Football Kenya Federation announced that the CAF Inspection team will not be coming in on Thursday as planned. Instead, Constant Omari, the CAF Second Vice President will be flying into the country Sunday night to ‘assess the political situation in the country’. This follows last Friday’s Supreme Court ruling that annulled Uhuru Kenyatta’s election as president, ordering a fresh poll in 60 days. “We have just been informed that in light of the recent happenings CAF will be sending its second Vice president to assess the political and security situation of the country, before they can proceed with the inspection visit,” Nick Mwendwa, the FKF president said in a communique. CAF is now set to announce a new inspection date basing on the report to be given by Omari after his tour of the country. The slightest of hopes that the tournament will remain in the country will be based on whether or not the entire budget for the rehabilitation of stadia was released before hand. The Presidential Election is a costly exercise for the country and all priorities at the moment will be on funding the Electoral Commission. A close source at the Federation who declined to be named has admitted there is a serious concern whether CAF will indeed give Kenya a thumbs up, with the stadia progress already a concern. Work at almost all the venues kicked off proper last week with Nyayo and Machakos leading the way with constructors promising to complete the job in 14 weeks. “Everyone is worried to be honest because this is a new dynamic. But let’s see what CAF will say. No one knows. If it was the issue of the stadia alone we were dealing with, there would be some confidence. But now, things are different,” the source intimated. Morocco and South Africa had been touted as possible hosts should Kenya fail to be cleared to host. 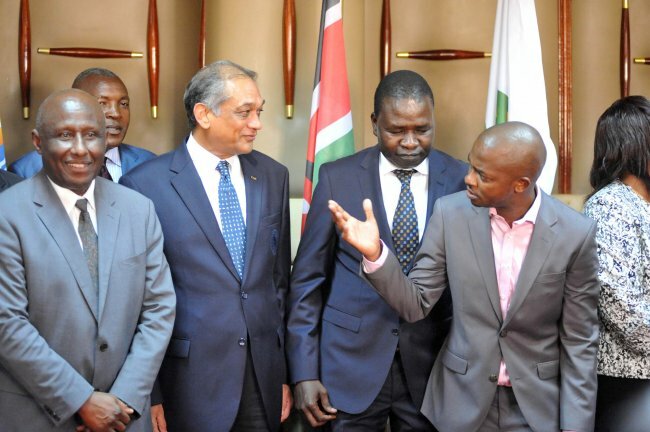 In his last visit in June, Omari met with government officials led by Hassan Wario, the Sports Cabinet Secretary who assured that the government is committed to host the games. A budget of Sh6bn has already been approved for the two-week championship.